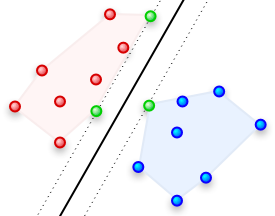 Slides of my seminar talk of February 28th 2008 on the Geometry of Support Vector Machines. Topics include the kernel trick and soft margin classification. Then a nice geometric algorithm working on the reduced convex hulls by Mavroforakis et al., and briefly mentioning the smallest enclosing ball interpretation (Core Vector Machine) by Tsang et al..
For QuickTime, Keynote or as PDF.